For songs of a similar title, see Higher and Higher (disambiguation). "I'm the One to Do It"
(1967) "(Your Love Keeps Lifting Me) Higher and Higher"
(1967) "Since You Showed Me How to Be Happy"
"(Your Love Keeps Lifting Me) Higher and Higher" is an R&B song, originally performed and made a Top 10 Pop, #1 R&B hit by Jackie Wilson in 1967. As the song was originally used as a backing track for Wilson to use later, it was recorded on July 6, 1967, at Columbia's studios in Chicago. Produced by Carl Davis, the session, arranged by Sonny Sanders, featured bassist James Jamerson, drummer Richard "Pistol" Allen, guitarist Robert White, and keyboardist Johnny Griffith; these four musicians were all members of the Motown Records house band The Funk Brothers who often moonlighted on sessions for Davis to augment the wages paid by Motown. According to Carl Davis, the Funk Brothers "used to come over on the weekends from Detroit. They'd load up in the van and come over to Chicago, and I would pay 'em double scale, and I'd pay 'em in cash." Similarly two of Motown's house session singers The Andantes, Jackie Hicks and Marlene Barrow, along with Pat Lewis (who was filling in for Andante Louvain Demps), performed on the session for "Higher and Higher". The song was originally written by Chess Records' in-house writers and producers, Carl Smith and Raynard Miner, and initially recorded by The Dells for the label but not released. Another writer, Gary Jackson made some changes to the song and pitched it to Davis at Brunswick. When the singer recorded his vocal track, Davis recalls, Wilson originally sang the song "like a soul ballad. I said that's totally wrong. You have to jump and go with the percussion...if he didn't want to sing it that way, I would put my voice on the record and sell millions". After hearing Davis' advice, Wilson cut the lead vocal for "...Higher and Higher" in a single take. A publishing deal for the song was reached with Brunswick after Chess producer/A&R head, Billy Davis intervened. Writing credits were agreed with Smith, Miner, Jackson and Billy Davis all named. Later, Davis removed his credit and BMI now lists the song as by the three other writers. The Dells' version appeared on their album, "There Is" for Chess subsidiary, Cadet the same year. Released in August 1967, the song reached No. 1 in the US Billboard R&B chart and, in November, peaked on the Billboard Hot 100 at No. 6. In the UK Singles Chart, Wilson's version was a hit in 1969 (No. 11), 1975 (No. 25), and 1987 (No. 15). The track was ranked No. 246 on Rolling Stone's list of The 500 Greatest Songs of All Time, and was inducted into the Grammy Hall of Fame in 1999. In 1970, the song was recorded under the title "Higher and Higher" by Canada Goose, a group from Ottawa who had been discovered by Jerry Ragovoy. This version, with a shared lead vocal by Barbra Bullard and John Matthews, became a hit in Canada (#44) and reached #92 on the Record World 100 Pop Chart. 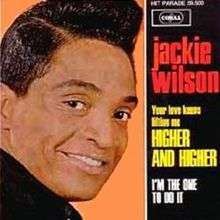 It was also recorded by The Dells on their 1968 hit album There Is; it was recorded by the group in 1967, and is reputed to have been the original version, and was recorded with slightly different lyrics than the better-known Jackie Wilson hit version, but was not released as a single. In a recorded interview with famed Cleveland/New York Dee-Jay Norm N. Nite, Jackie stated that when he first heard a tape of the song, "a vocal group was singing it". That group was quite probably The Dells. Dolly Parton included a recording of the song on her 1977 New Harvest - First Gathering album; she has frequently included the song in her concerts from the late 1970s - present. Michael McDonald included a recording of the song on his 2008 album, Soul Speak. Also in 2008 the song, still known as "Higher and Higher", charted in Sweden due to Kevin Borg, the eventual winner of season 8 of Idol, performing it in the competition, and downloads of Borg's version secured it a #29 ranking. 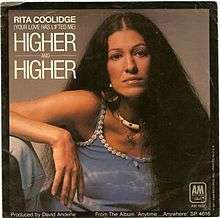 "(Your Love Has Lifted Me) Higher and Higher"
originally "I Don't Want to Talk About It" replaced on later pressings with "Who's To Bless And Who's To Blame"
(1975) "(Your Love Has Lifted Me) Higher and Higher"
In 1977 Rita Coolidge remade the song as "(Your Love Has Lifted Me) Higher and Higher" for her album Anytime...Anywhere. Her version is more mid-tempo than the driving original and largely omits the chorus which is evidenced only in the background vocals sung under the repetition of the first verse with which she closes the song. Coolidge and her sister Priscilla Jones had sung background on a version of the song for a prospective album by Jones' husband Booker T. Jones; when that album was shelved Coolidge asked him if she could cut the song using his arrangement. Released as a single, her version became Coolidge's first major hit in nine years of recording: the track peaked at No. 2 on the Billboard Hot 100. Cash Box ranked it at No. 1. "Higher and Higher" also reached No. 1 in Canada. Both the song and a subsequent release, "We're All Alone", earned Coolidge gold records for each selling a million copies. In the UK it was released as the follow-up single after "We're All Alone" which had reached No. 6, but it only achieved a peak of No. 48 there. ↑ "Record details at 45.cat". 45.cat.com. Retrieved January 29, 2014. ↑ "Jackie Wilson on Columbia Records". Archived from the original on July 20, 2009. Retrieved 2009-06-30. ↑ Whitburn, Joel (2004). Top R&B/Hip-Hop Singles: 1942–2004. Record Research. p. 630. ↑ "Higher & Higher: The Chicago Soul of Jackie Wilson 1966–1976 – Rate Your Music". Retrieved October 20, 2014. ↑ Canoe.ca. "Canadian Pop Encyclopedia-Canada Goose". Archived from the original on May 9, 2009. Retrieved May 6, 2009. ↑ "100c". Archived from the original on July 23, 2009. Retrieved 2009-07-22. ↑ "Jackie Wilson - The Man Behind The Music - Rare Interview". YouTube. 2010-12-22. Retrieved 2016-09-30. ↑ "Sweden Singles Top 60 (December 4, 2008) – Music Charts". Archived from the original on May 10, 2009. ↑ "Country Music People 10/06". Archived from the original on May 6, 2009. Retrieved May 4, 2009. ↑ Cash Box Magazine (September 10, 1977). "Cash Box Top 100 9/10/77". Web.archive.org. Archived from the original on August 14, 2012. Retrieved 2014-07-17. ↑ "NZ Top 40 Singles Chart | The Official New Zealand Music Chart". Nztop40.co.nz. 1977-10-16. Retrieved 2016-09-30. ↑ "Australian Chart Book". Austchartbook.com.au. Retrieved 2016-09-30. ↑ "Image : RPM Weekly - Library and Archives Canada". Bac-lac.gc.ca. Retrieved 2016-10-28. ↑ "Top Selling Singles of 1977 | The Official New Zealand Music Chart". Nztop40.co.nz. 1977-12-31. Retrieved 2016-09-30. ↑ "Top 100 Hits of 1977/Top 100 Songs of 1977". Musicoutfitters.com. Retrieved 2016-09-30. "The Way You Do the Things You Do"